“I’m a racist…but what we are not is bigots,” Gary Johnson said. Johnson takes issue with the characterization of racism as a negative word. Johnson, a Marion resident, lives in the house that once belonged to Confederate General and Ku Klux Klan Wizard Nathan Forrest. Forrest led the Rebel troops in the 1865 Battle of Selma and Johnson honors his legacy by serving as the commander of the local Sons of Confederate Veterans group called Gen. Isham W. Garrott Camp #764. Each year on April 26, the camp hosts a ceremony for the area’s Confederate Memorial Day, a holiday in honor of Confederate soldiers who died in the civil war. Marion Cemetery’s Confederate Memorial is located adjacent to the cemetery entrance. For Confederate Memorial Day Sunday afternoon, the cemetery gate was draped in strings of mini confederate flags, and three full-size flags were displayed at the base of the Confederate Memorial, one for the state of Alabama, the Confederate flag, and the “Stars and Bars” flag of the Confederate States which was designed in Marion by Nicola Marschall, a German-American artist. A little over a dozen community members, young and old, gathered near the memorial under the branches of a large tree. A boy sat wearing a confederate uniform. An 18-year-old boy rested his arms on a Confederate flag on a pole he carried into the cemetery. A family played with their baby daughter. As the cradle of their cause,” Johnson recited. A woman in a black lace civil war era dress and black flip flops stood behind the memorial, pounding drum beats with a wooden spoon on the lid of a pot, and the loud cries of a man rang out, reciting the names of dead Confederate soldiers. H.K. 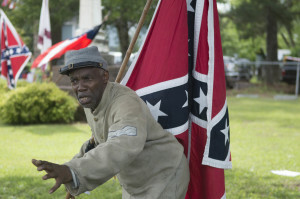 Edgerton, embraces the pre-war south, at a ceremony honoring Confederate soldiers. As he marched into view through the cemetery gate, H. K. Edgerton, a middle aged black man dressed in a full Confederate uniform, continued his chant, making his way to the group. “The South could find peace only in independence!” Edgerton roared. The Civil War was fought for the liberty and freedom of the ‘Southland,’” he said. As he continued his speech, he waved the Confederate flag, and at times gathered it around him, like a shroud. “February—so-called Black History Month—I call it ‘beat up on white people’ month, which it is,” Edgerton said. “Oh, I wish I was in the land of cotton, old times there are not forgotten!” sang the group enthusiastically. Ceremonies such as this are not uncommon in southern towns today. Marion, a half an hour north of Selma, has a population of just over 3,500 people and is nicknamed “the college city” for its three schools: Judson College, Marion Institute, and the Marion Military Institute. The town has many ties, historical and sentimental, to the Civil War. The local Sons of Confederate Veterans group Gen. Isham W. Garrott Camp #764 was originally started in 1924, though it was disbanded after World War II. It was reinstated in 2006. With only 10 members, the camp today is small, but active. Mark Thurber is adjutant at the camp, and its “unofficial secretary” since it became active again in 2006. He said he enjoys attending the event each year. Johnson feels a deep connection to Civil War era history—and in particular Confederate General Nathan Bedford Forrest. Forrest is a divisive figure in Dallas County. Some celebrate him as a hero of the Confederacy. Others point to his leadership position within the KKK as evidence of his bigotry. “Foremost, white people need to get over the guilt,” Johnson said. Johnson’s civil war-era home sits behind a tree grove, Confederate flags proudly on display. While Marion was an important part of the Civil War, Marion also played an important part in the Civil Rights Movement. In 1965, protests in Marion and the death of black Marion resident Jimmie Lee Jackson served as a catalyst and a call to the leaders who would begin the Selma march to Montgomery later that year. 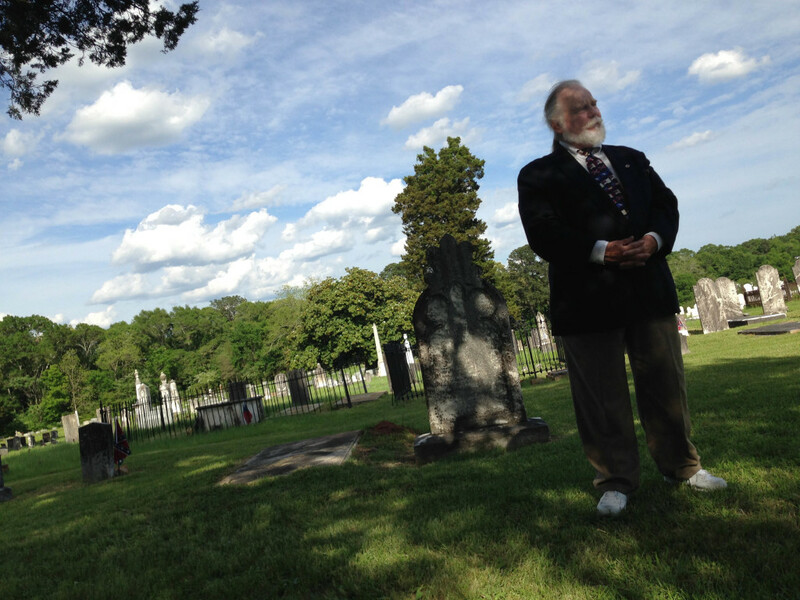 Back in the Marion Cemetery, after the ceremony drew to a close, participants pulled down the string of Confederate flags hanging on the entry gate. Folding chairs were thrown in the back of pick-up trucks. Finally, the Confederate flag wreath and the full sized Alabama, “stars and bars” and Confederate flags were taken from their place of honor at the base of the Confederate memorial. Johnson’s wife, Sandra Johnson, carefully folded the flags with her teenage granddaughter. The flags were going back to their permanent home, the historic residence of Confederate General Perry. They would remain there, proudly displayed.